« Soapmaker’s wishlist for Christmas – what to buy your beloved one! Jena left a comment at my Homemade cosmetics recipes page with a request of adding more recipes. Then I realized, it has been almost a year since I posted my last recipe, so here it is! A recipe for my favourite orange blossom soothing hand cream for (not only) dry hands! It contains shea butter for its skin repairing effects (loads of good phytosterols), orange blossom water (it smells divine and invigorates, refreshes, soothes and regenerates the skin), glycerin (moisturizing) and my personal favourite ingredient – panthenol (provitamine B5), which is just always good for our skin! In addition, this recipe features another natural emulsifier Olive Douceur, which I like very much, since it makes very soothing and silk emulsions. 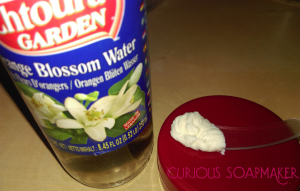 Orange blossom water has a strong flower fragrance and I added a bit of palmarosa and lemon to refresh it. So enjoy and let me know if you like it! 3. Slowly pour phase B into phase A while continuously stirring – you can use blender, it will make the emulsion more creamy and thicker. 4. When the emulsion formed, stir until its temperature drops to around 40 ° C. You can put your pot in cold water in order to accelerate the cooling. 6. Let the emulsion cool to the room temperature and then distribute into the cream pots. Let completely cool down in the pots and only then cover them with lids! (otherwise the vapors will form on the inside of lids). This entry was posted by evik on December 29, 2015 at 19:05, and is filed under cosmetics making, dry skin, hands. Follow any responses to this post through RSS 2.0.You can leave a response or trackback from your own site. Thank you for posting this recipe. I just tried it and like it very much. I do, however, find it a bit greasy. What would you suggest to make it less greasy? The addition of IPM? Something else? Hi Nicole, funny you say it is greasy – I get a lot of “not greasy enough” feedback from many people 🙂 For me, it is just about right, but I know everyone is different. For less greasy, I would substitute some light oil (almond oil, grapeseed oil…) for part of the shea butter, or even substitute it completely. The cream might be less thick afterwards, but I think it would be fine. I cannot say enough good things about this recipe! the amount of moisture what perfect for my skin. so thank you so so much. I did get some of my ingredients at bulkapothecary.com/categories/soap-making-supplies.html and was pleased with how it turned out. I don’t know if that made a difference but I loved it anyway. thanks again. Thank you for the great blog. I have to say I love all the recipes because I already use the oils and bases, but you give me another idea of how to use them. If you are looking for more affordable, quality products you should visit Bulk Apothecary (bulkapothecary.com/categories/soap-making-supplies.html). I have used them for years and loved it. Thanks again for the great read! what can I sub for beeswax? another butter and what would work well? thank you so much! Hi Marinna, the beeswax is quite crucial here, it thickens the cream and stabilizes it. I am not sure if other waxes would work as well, since beeswax was shown to have at least partial emulsifying properties. Butters would definitely not be sufficient. Can you substitute any other ingredients for the shea butter, or is it absolutely necessary? I’ve been following your exceedingly interesting experiments for several years now. I was most impressed with your wedding soap as a cake subsititue, it really looked fantastic and I don’t even want to start thinking of how complicated it must have been! Regarding this specific recipe, what would you suggest as an alternative preservative? Would grapefruit seed extract (from aroma-zone), leucidal, planta S do or would they cause the emulsion to break down?